Discussion in 'Transformers General Discussion' started by e3nine, Mar 5, 2008. If so, post a picture! Flame me or not, I'm a fan of the Dreamwave stuff. I've recently been purchasing what I can find and framing them for future hanging. DW Superion vs. Devastator, above my Classics display case, with extra added Gundams! Scored this over the weekend for free from a local comic shop while home visiting my parents. Limited to 1,000 prints, I've got it framed now, but don't have any pics yet. 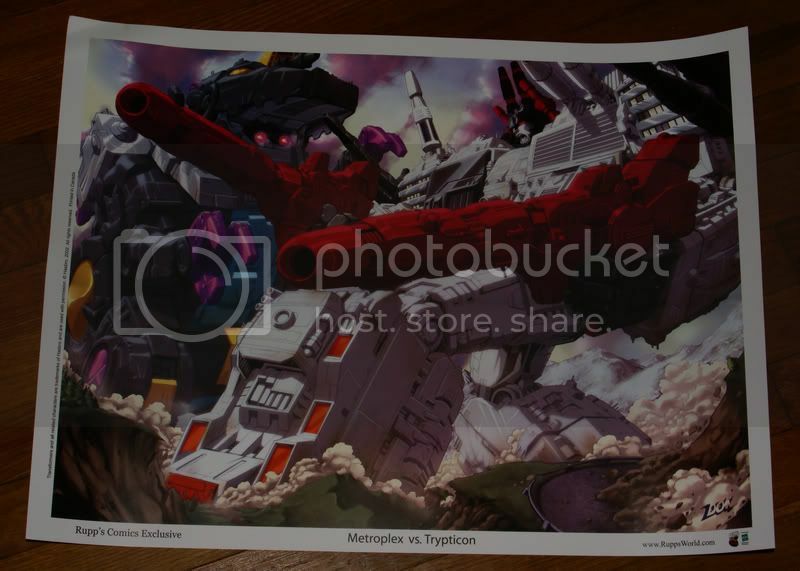 I've got the 600+ mega litho and the '86 movie poster above my tv in the living room and the Megatron group poster hanging above my couch. Unfortunately, when I move into a bigger place my with fiance, they're going to have to go into the second bedroom instead of the living room. 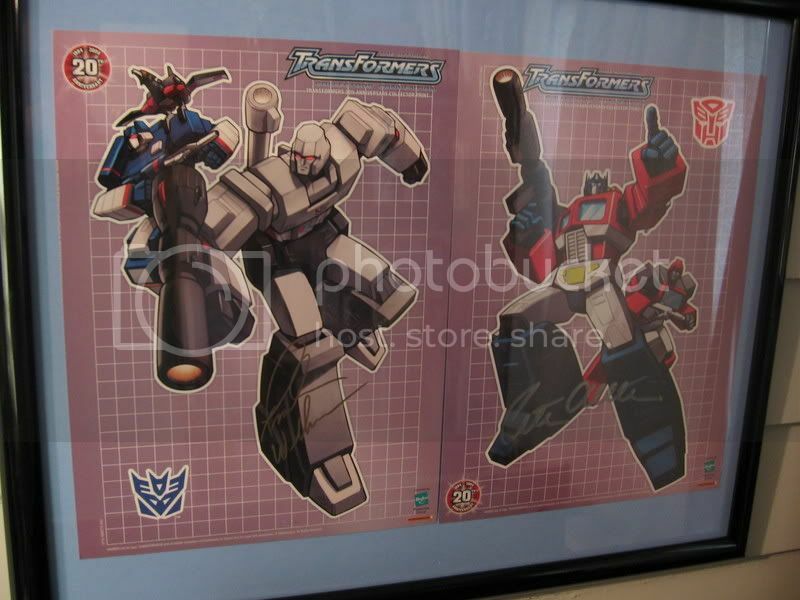 I've got the G1 poster that came out this past summer, DW Starscream, G1 Checklists, an original transparency used in the production of G1 Ultra Maguns' box art, and a poster size blow up of G1 Frenzy box art transparency (sporting gold weapons from RatBat/Frenzy 2-pack). 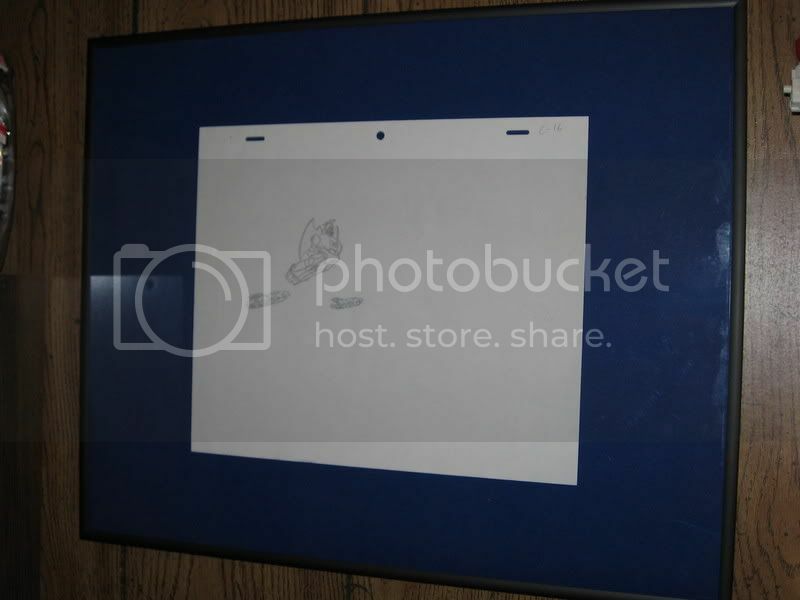 I want to put up my Alternated Masterpieces litho, what is a good way to hang something like this? I think a frame would be too expensive since it is pretty big. How big is it? My Devastator / Superion one and Starscream one are around 90cm long each, picked up a frame for each one from Ikea for like £12? I have the 24x36 expanded version of my avatar. Does that count? Hobby Lobby has 50% off all poster frames and custom frames until Sunday. Picked up two 24 x 36 poster frames for $10 each and I am deciding on whether or not to get a 24 x 30 litho custom for $30. You can check if the store near you is doing the sale by visiting the link below as it is select locations only. >:3 I paint wall murals. I plan on doing a EPIC picture of movie Starscream (along side with some other fictional characters I like). It'll probably be this spring/summer.